Yet about half of this elite population have their main residences within a group of just 10 cities, according to Knight Frank’s 2019 Wealth Report, which lists London, Tokyo and Singapore as home to the most people worth at least $30 million. Although the US is the world’s largest economy, New York is its only city in the real estate brokerage’s top 10. Today, the mixture of capitalist, socialist, and communist philosophies have created a globalist elite not known heretofore. These wealthy people totally ignore international borders, customs, language, and traditions. In most cases, they are above and beyond the reach of national regulations. A recent article in the EU Observer headlines an article, “Malta and Cyprus, EU Passport Sales Under Fire.” It documents that Malta and Cyprus have sold more than 6,000 national EU passports. It continues, “…have been used profusely by Russian citizens and citizens from countries under Russian influence.” Thus, one clearly sees, to obtain a passport, it’s just a matter of money. However, these super-rich are greatly admired by the general public. Actually, many media organizations entice the masses to follow in the footsteps of the super-rich. One only has to look at the publications prominently displayed at the checkout counter in the supermarket. But what does the Bible say? “Ye have lived in pleasure on the earth, and been wanton; ye have nourished your hearts, as in a day of slaughter. Ye have condemned and killed the just; and he doth not resist you” (James 5:5-6). #1068 Just what lies ahead for America? 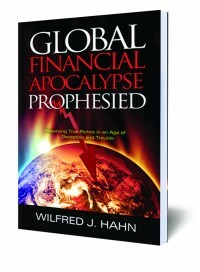 How will a global financial apocalypse unfold?